What is your idée fixe? Mine is to hit the road and understand the world. French on my passport, I speak 6 languages, have lived in 5 different countries so far, and feel at home pretty much anywhere. Currently I am based in Istanbul. I work hard, and all my income supports my travels; every travel opportunity is good for me, but where I’ve spent most of my free time is in the Balkans and in Russia. When travelling, everything is an experience – a blessing for a curious, analytical, spirited mind like mine. Impressive, moving, weird, amusing, pleasant, eye-opening; I tell about my travel stories and impressions in this blog. Out of all my travels, what has impressed me most is the kindness of people, and how much we all have in common; because we’re all the same humans across the planet. Read about my top 3 best places to travel to see some examples of what I call true travel. It is all about experiences; and cultural encounter forms an essential part of them. By sharing my travel stories, I am hoping to also share my vision: travel can contribute to make this world at least a tiny better place. Although I have visited more than 60 countries to date, the journey that symbolises best what travel is to me took me a whole winter to Siberia. 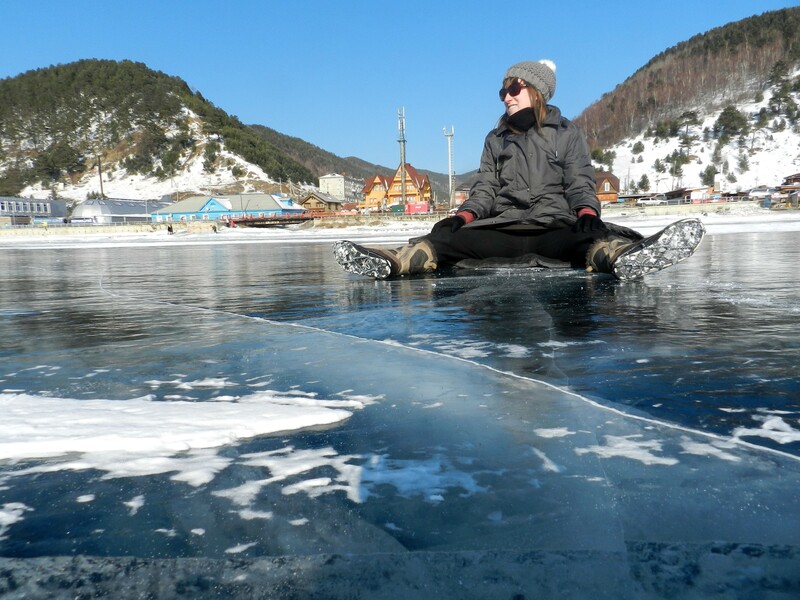 On this photo you can see me sitting on frozen Baikal Lake. To find my posts, use the search engine, click on my blog’s popular tags, or browse in the list of my recent posts. A note: I write a lot about propaganda because I love political history, find propaganda funny at times, and also want to demonstrate that politics is just what the authorities of the moment are asserting, and has nothing to do with the actual people – who share a lot of human traits everywhere in the world. Enjoy reading my travel stories; and I hope they will inspire you to also share yours! Lovely and informative blog you have here. Looking forward to catching up on your travels. Hello, I did check out some things on oyur blog. I’m Polish, so of course I checked Poland tag. PRL? WW2 and Jews? Chopin? You forgot the Old Town to fill in the stereotype. Warsaw and Poland has much more to offer than those things you posted about. Please explain me, how it’s “understanding the world”? I am with you on the journey. Thanks so much Sergey, really appreciated. I’ve read your post and enjoyed your post about Myanmar – we definitely agree on the importance of enjoying daily life when travelling! Interesting idea. Sharing your About Me gets people to see who you are. I like it! I am very impressed with your enthusiasm to travel, and it is truly amazing that in my opinion, you have done to 60 different countries to learn about every culture. I hope, you are given health and strength, and always write down every story you find on your journey. and by the way, can you tell or write a propaganda story, what is funny to you? Have you ever visited Indonesia ? or exactly to Bali, which earned the nickname as the island of gods?